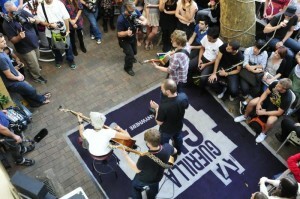 Earlier this week it was Adelaide’s turn for the Channel [V] Guerilla Gig treatment when superstar group Good Charlotte turned up smack bang in the middle of the Rundle Mall. Today, the Guerilla attention turned to Sydney, where reformed outfit Jebediah plopped by the Sydney University Of Technology this afternoon to perform for a gaggle of unsuspecting students. They acoustically performed four tracks from their new album ‘Kosciuszko’ and followed those up with a rendition of the band’s first ever single ‘Leaving Home’. Where will the next one be? Who knows. That’s the nature of the Guerilla beast.